BIOL 395, Extreme Physiology, is a travel course created by University of Scranton Biology Professor Terrence Sweeney. The course is offered every other year by Sweeney and Scranton faculty member Tara Fay, with the essential participation of faculty from the University of Arizona Colleges of Medicine and Nursing and faculty from Northern Arizona University. 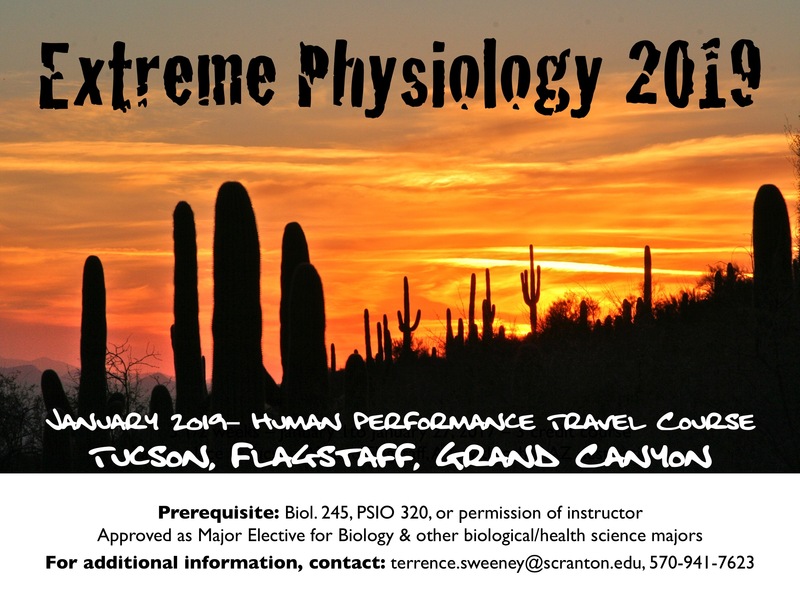 This unique course exposes the student to the stunning and diverse environments of Arizona in the course of investigating human physiological adaptation to extreme environmental and aerobic challenges. Utilizing the student as both subject and investigator, challenges include exposure to the desert environment, prolonged bouts of exercise (e.g., cycling, hiking, running, skiing, swimming), and extreme changes in altitude. The student will document his/her progression of cardiovascular and respiratory conditioning throughout the 3 1/2 week course duration. Accompanying instruction will explore environmental challenges, adaptive mechanisms of native flora and fauna, and compensatory mechanisms operating in key human physiological systems. The course is approved as a major elective for University of Scranton Biology, Biophysics, Exercise Science and other biological science majors. Click on the Blog tabs above to read about some of the adventures from the previous offerings of the course! Click on the Course Documents tab above to access information about the course as well as course application documents. Return to the University of Scranton Biology Department web page.